"Our mosque is open to all as a place of refuge," said Imam Makram El-Amin of Masjid An Nur in North Minneapolis. Imam El-Amin has been a busy man since the tornado struck this past Sunday. With the devastation wreaked by the tornado a few blocks away from the mosque, Imam El-Amin and his congregation found themselves at the forefront of providing relief to North Minneapolis residents. Utilizing the services of the recently launched Al Maa'unn, the Neighborly Needs Community Outreach program at Masjid An Nur, Imam Makram and his team have arranged for over 1500 meals for North Minneapolis residents since Monday. This was done in partnership with several local organizations such as El-Amin's Fish House, the Holy Land Bakery, Marina Deli, Safari Restaurant, and several mosques. 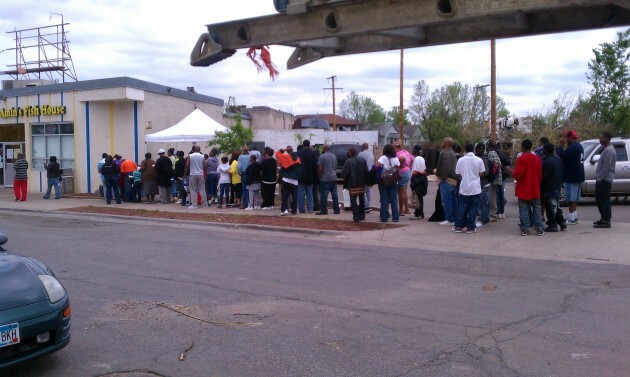 The Al Maa’unn Neighborly Needs Community Outreach program plans to feed at least 500 people a day in the next few days. The Twin Cities Muslim community has stepped up to the occasion and is mobilizing help and support for North Minneapolis residents affected by the tornado. Several Twin Cities mosques have designated this Friday as a fundraising day for relief work and will be collecting cash donations, bottled water, personal hygiene items and more. Many mosques will also pray for the people who were affected by this natural calamity. Imam El-Amin summed up the relief efforts as follows, “We are here for anyone who needs help regardless of their color, ethnicity, or religious affiliation. Islam calls us to help our neighbors without any qualifiers attached." The recent tornado disrupted a few lives, but it also paved a way to connect hearts and bring out the best of the human spirit. Zafar Siddiqui is a co-founder of the Islamic Resource Group (IRG), an educational outreach organization dedicated to building bridges between Muslims and people of other faiths. He currently serves as the director of interfaith and civic relations at IRG. Read more about Zafar Siddiqui. Christianity and Islam are the two dominant religious groups in our world. According to the Pew Research Center, the number of Muslims worldwide will be "nearly as numerous as Christians" by 2050. The study also points to the interesting statistic that for the first time in history, the number of Christians and Muslims will be 2.9 billion and 2.8 billion respectively. In view of this, interfaith relations assume an added significance. Christians and Muslims have a duty to work toward peace and betterment of humanity through a shared framework. It is imperative that the mainstream leadership take an active role in promoting positive relations that are based on the universal principles of these two world religions. Congressman Keith Ellison honored Lori Saroya in the Congress for her leadership and advocacy efforts in Minnesota. The generalizations that we see in response to the terrorist attack in France are blurring the reality. These two hashtags give us a better understanding of the reality - an individual who paid with his life to protect others, and another individual who is being asked to answer for someone else's crime. Yes, it is the truth that Muslims love Jesus (peace be upon him).